Each day and with nearly every conversation, one sees either unwillingness or lack of skill in how to engage in productive, civil dialogue about issues that matter. 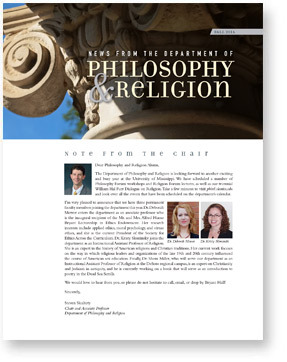 The Department of Philosophy and Religion has long trained students in how to approach, analyze, and discuss the most contentious issues ranging from questions of personal religious belief to ethical practice and living to social policy implementation. Many alumni from our department have applied these skills in unique ways to various areas of specialization, and we see them as a unique resource for our current students and the community. Our range of Dialogue Initiative events provide an educational resource for such specialized content as well as models offered by current UM students for how to engage in civil conversations about the most contentious issues of our time. Student led, guided conversation in groups on an Ethics Bowl case over appetizers and drinks. 6 panelists of alumni, UM faculty, and community leaders discuss various policy proposals on the topic.